A good night’s sleep is at the forefront of every guest’s mind, while a bad night’s sleep will weigh heavily on their opinion of the hotel. You all know this. After all, sleep is what you’re selling. Where it gets complicated is determining what comfort and cleanliness mean to your guests. Everything from noise, room temperature, lighting, and air quality to room cleanliness, towel softness, and front desk service contribute to a guest’s comfort and, in turn, determine how well they sleep at your property. And that’s before they even put their head on a pillow. Moreover, the baseline for expectations keeps changing. The JD Power North American Hotel Guest Satisfaction Index for 2016 revealed that perks are fast becoming standards. According those surveyed, the most important amenities are Wi-Fi, breakfast, and parking — all for free. Seventy-one per cent of guests said they received complimentary Wi-Fi, 56 per cent received complimentary breakfast, and 61 per cent received free parking. The fourth most important amenity? Luxurious bedding and linens — and yet only 37 per cent of guests said this was offered in their room. In other words, hotels not offering these amenities fell short of expectations. Luxury beddings and linens isn’t at the top of the list quite yet, but it does nudge hotels to review their sleep offerings. And as Jordanna Caine, national contract sales manager for Springwall Sleep Products points out, the most important part of a hotel room is the bed. Where do you Start? At theTop. You have some choices in how and when you upgrade. One opportunity is if your mattresses are wearing. It helps to have a maintenance plan that includes regular flipping, rotating, and checking mattresses for wear and damage. “With a good maintenance and replacement plan in place, mattresses and bedding are replaced before bad reviews about quality of sleep start creeping in,” says Caine. Upgrades to increase the comfort levels in your suites and larger bedrooms can take place gradually, with multiple phased installations over many months or years, suggests Nowak. Room renovations are another opportunity to upgrade. “Aside from individual replacement due to irreparable damage, mattresses are usually changed as part of a larger makeover or renovation project, usually coinciding with a refurbishing — either by floor or wing — as this is the most logical and cost effective time to do so,” says Wielens. McClintock agrees. “When renovations are being considered, the operator also addresses the upgrade of the bedding packages, which includes the mattresses and the sheets,” says McClintock, adding that not only do a comfortable bed and clean new sheets add to the appeal of a renovated room, but renovations also allow operators to increase room rates. Just as you choose your bed supplier with care and consideration, so should you choose your linen supplier. 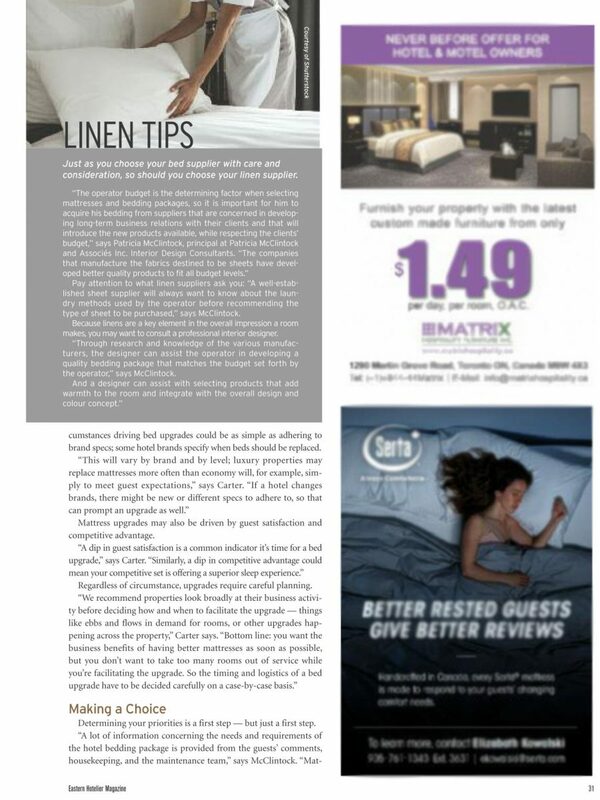 Pay attention to what linen suppliers ask you: “A well-established sheet supplier will always want to know about the laundry methods used by the operator before recommending the type of sheet to be purchased,” says McClintock. Because linens are a key element in the overall impression a room makes, you may want to consult a professional interior designer. “Through research and knowledge of the various manufacturers, the designer can assist the operator in developing a quality bedding package that matches the budget set forth by the operator,” says McClintock. cumstances driving bed upgrades could be as simple as adhering to brand specs; some hotel brands specify when beds should be replaced. Mattress upgrades may also be driven by guest satisfaction and competitive advantage. Regardless of circumstance, upgrades require careful planning. Determining your priorities is a first step — but just a first step. 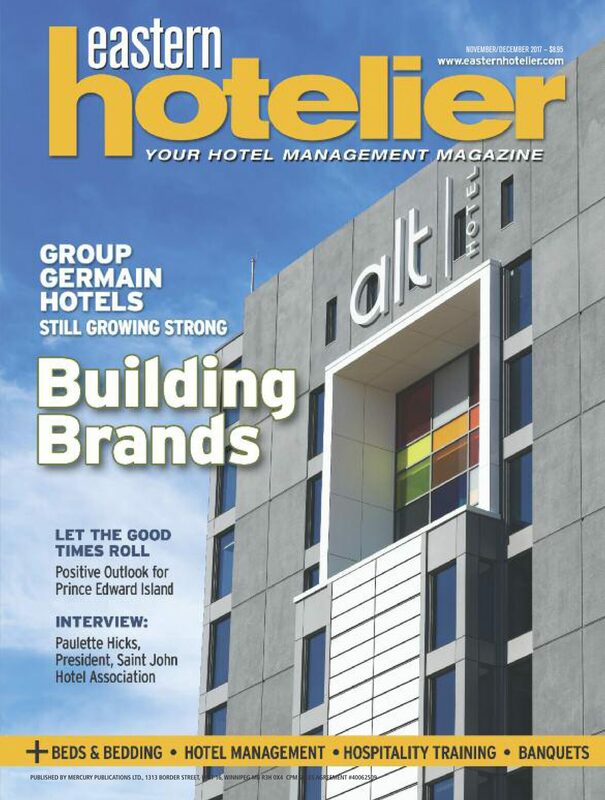 And while hotel type often determines choice, you may want to reach higher. It’s also a fabulous way to differentiate some of your rooms. 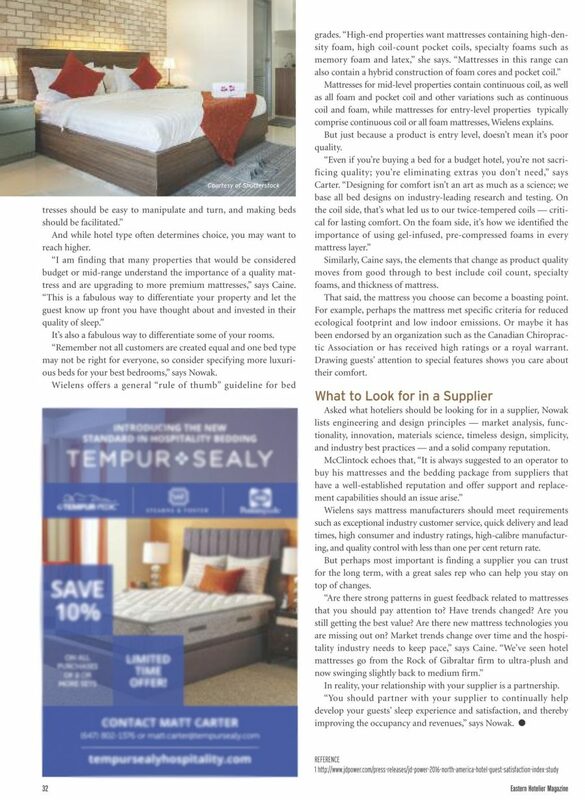 “Remember not all customers are created equal and one bed type may not be right for everyone, so consider specifying more luxurious beds for your best bedrooms,” says Nowak. Mattresses for mid-level properties contain continuous coil, as well as all foam and pocket coil and other variations such as continuous coil and foam, while mattresses for entry-level properties typically comprise continuous coil or all foam mattresses, Wielens explains. But just because a product is entry level, doesn’t mean its poor quality. Similarly, Caine says, the elements that change as product quality moves from good through to best include coil count, specialty foams, and thickness of mattress. That said, the mattress you choose can become a boasting point. For example, perhaps the mattress met specific criteria for reduced ecological footprint and low indoor emissions. Or maybe it has been endorsed by an organization such as the Canadian Chiropractic Association or has received high ratings or a royal warrant. Drawing guests’ attention to special features shows you care about their comfort. Asked what hoteliers should be looking for in a supplier, Nowak lists engineering and design principles — market analysis, functionality, innovation, materials science, timeless design, simplicity, and industry best practices — and a solid company reputation. 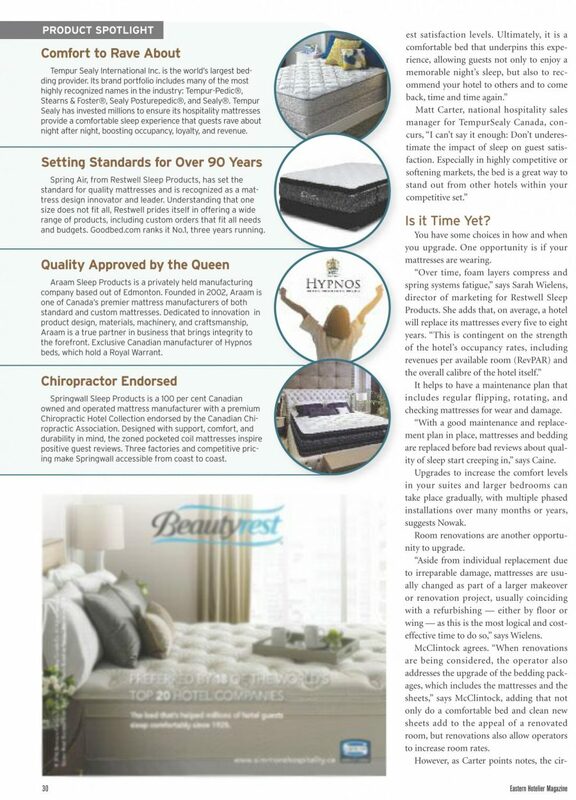 Wielens says mattress manufacturers should meet requirements such as exceptional industry customer service, quick delivery and lead times, high consumer and industry ratings, high-caliber manufacturing, and quality control with less than one per cent return rate. But perhaps most important is finding a supplier you can trust for the long term, with a great sales rep who can help you stay on top of changes. In reality, your relationship with your supplier is a partnership. 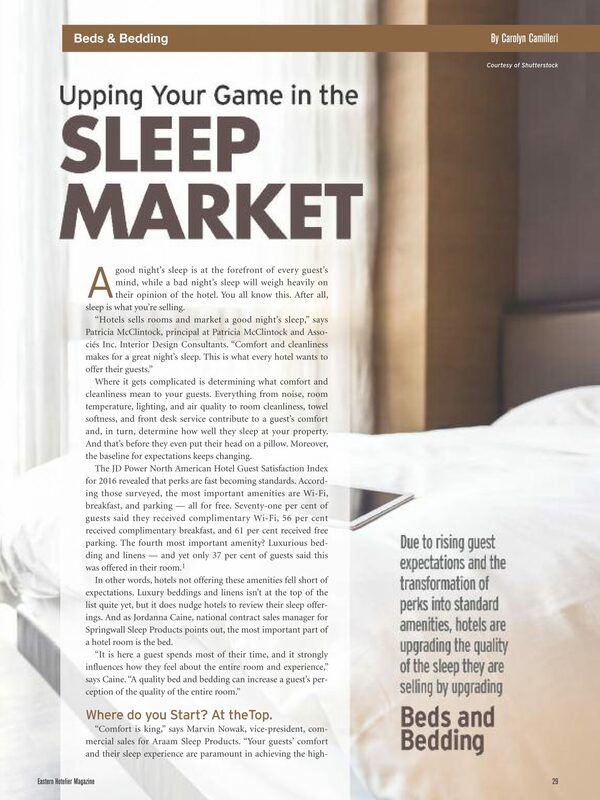 “You should partner with your supplier to continually help develop your guests’ sleep experience and satisfaction, and thereby improving the occupancy and revenues,” says Nowak.